I have fallen in love over wrap drape blouses. While hanging out with my sister, I stumbled upon this sheer vibrant wrap drape blouse at Pretty Girl in Brooklyn for $14.99 and had to have it. This top has the cross-over detail in the front as well as in the back. Of course, the store had several variations of the top and had to restrain myself and settle for just this one. When I returned home, I went on a seek and find mission for a pattern that would give me something similar. 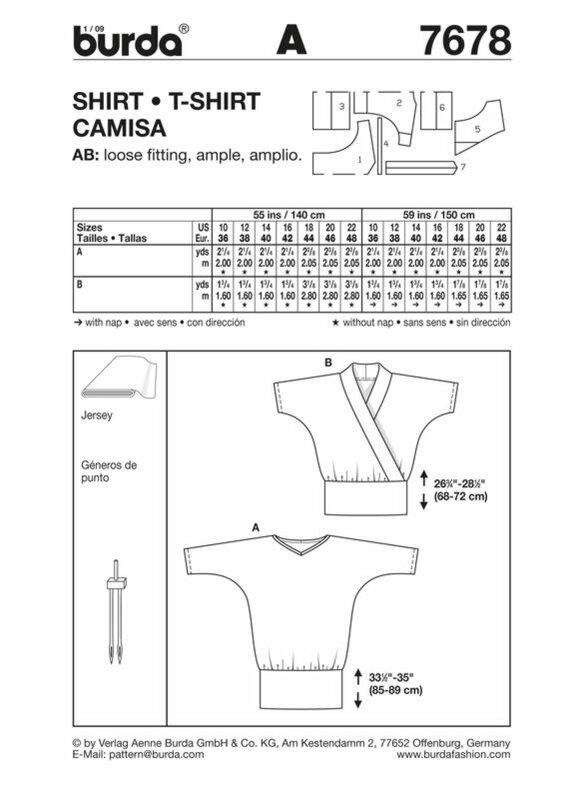 In comes Burda 7678, Kimono Blouse: Blouse A has 3/4" sleeves, v-neck and a banded waistband. Version B has short sleeves, cross-over bodice and banded waistband. Despite the pattern calling for Jersey fabric, I used a printed sheer poly woven. I looked for finished measurements, but didn't see any and opted to cut two sizes above my sister's usual pattern size, without the banded waistband, the length was perfect. The construction is straight forward and honestly, glanced at them once and moved on. The front edges were handled first in that the raw edges were folded in twice and stitched down, from there I did the same for the back neckline. Proceeded on & serged the shoulder seams and the side seams. Overlapped the fronts & basted into place. To strengthen the seams as well as keep them flat, I stitched down the seam allowances. For the hemline I serged and folded and stitched to the inside leaving a small opening & simultaneously creating a casing for the 1/2" clear elastic. Had my sister try the blouse on and adjusted the elastic to her liking and finished with stitching up the opening. Also, serged the sleeves and folded once to the inside and final stitched. The blouse is a breeze to make and immediately moved onto making one for me. I went with a size 16 for my version and its a clear indication that if a knit was used one would definitely have to go down 2 sizes than their usual pattern size. Looooooooooove this blouse, its just what I need for the lazy days of summer. 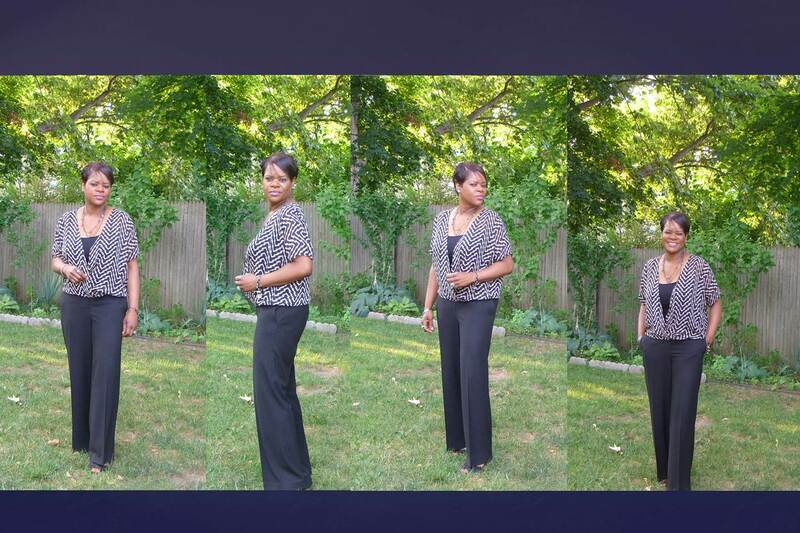 Paired the blouse with a walmart tank top and old black Loft slacks.... Can I say super comfy and easy breezy. A super fan of 9West's handbags.. had to make a pit stop. You always have such a great sense of style. Gorgeous top! This outfit looks awesome on you! Sheila you NAILED IT with this creation, just perfect! Hey Sheila. Super cute. I like the purse too. Wink, wink.